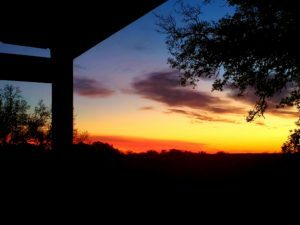 Watching the beautiful sunrise from my back porch as I think about my mother’s mother. We celebrated her 90th year on this planet. 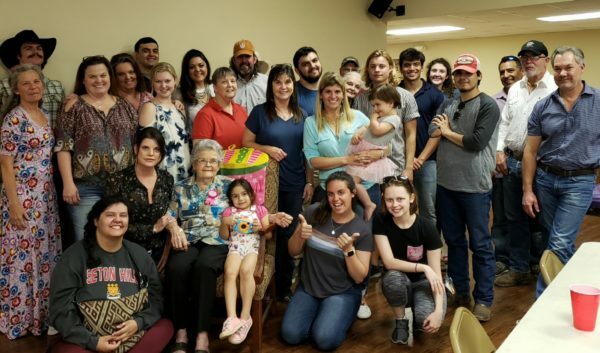 Her five surviving children, many of her grandchildren and a bunch of her great grandkids were there. It’s amazing when I think of everything she has accomplished the many storms her faith had carried her though. A legacy of love and faith is the best any of us can hope to achieve this life. Hanging out with my aunts, uncles, sister, cousins, nieces, nephews and my own kids is always fun. I’m blessed by an imperfect, flawed, but loving family. I’m surrounded by people I know will be there without a doubt if I needed them. I think that might be why family dynamics are a strong thread in stories. Another reason I write the stories I write is because of my Granner. My grandmother taught me many lessons, but the most important: to completely trust in God’s will. Easy to say but to live it is another challenge that I fail at times. To have faith that God is always good, even in the middle of the worse storm can be hard to see and, in our drive, to make things right or to control a situation, we can lose our way, lose our propose. In my new series arriving May 21, Elijah and Jazmine both must learn this lesson to find the love they were meant to have. But fear, doubt, and guilt must be turned over to God first. When Elijah De La Rosa runs into his ex-wife—the one person he hasn’t apologized to for his youthful mistakes—he’s shocked to discover they have a five-year-old daughter. But can he convince her he’s a changed man worthy of the title daddy…and, possibly, husband? These were two of the hardest character to write, but I came to love them so much and wanted to make sure to get their story right. They had not trusted God and took matters into their own hands – of course we know what kind of trouble we find when we turn from God. I love writing the happy endings for not just my hero and heroine, but the families too. I love themes of forgiveness and righting wrongs. Sometimes it the forgiveness that God has given us that can be the hardest to accept. What themes do you love seeing in a book? 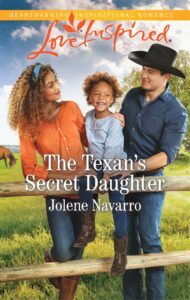 After his daughter suffers a rodeo injury and winds up recovering alongside his first crush, Nikki Bergmann, devoted dad Adrian De La Cruz becomes even more protective of Mia – and his heart. But as the bond between Mia and Nikki grows, Adrian can’t help falling for Nikki once again. Will long-buried secrets tear them apart… or can Adrian finally build a future with the women he’s never forgotten? I envy your family, my family is not like yours and were so toxic to my mental health I had to cut all ties. That was a smart move. We hope for others to respect and love others but when they don’t we have to cut those connections. Thank you for stopping by. Your very blessed to still have your mother with enjoy the great times. God bless you and thanks for all the wonderful books you have written. Hoping this is where I leave a reply. Love the books you write and it’s such a tribute to your Granner. She enjoys the books you write so much! I’m greatful to have her in my life as I didn’t get the opportunity to have my mother survive to have great grandchildren and know her as a mentor. Miss her so. So I live vicariously. Love this huge, dynamic family! It’s a crazy one but it’s fun!! Yes, family is formed in so many ways. My mom didn’t get to see her grandchildren grow up or meet any of their children. Having Granner is a true blessing in so many ways. What a wonderful gift for her to be surrounded by all her loved ones! She certainly doesn’t look 90. As for books, I like almost any theme. My fave is second chances, small towns, etc. What a blessing it is to have such a wonderful family. You’ve made me reminisce about my own grandmother and my husband’s. My husband’s grandmother lived with us until she went Home, and, despite the language barrier, I’m praying that her legacy of faithfulness and service will be remembered by my children. My in-laws and I spoke different languages but it didn’t stop the respect and love. Thank you for stopping by. The themes I like to see are hope and forgiveness. These books look extra interesting. My mother passed away last year at 101 and I just became a great-grandma! I’m the only one of my siblings to have children. Wow, Paula. 101 is amazing. Those are great themes and some of my favorites to explore over and over again. My grandmother was the only one of her siblings to have children. We joke that she made up for sisters. My family too was so toxic to my mental health that I cut all ties many years ago. I still talk to a cousin on Facebook but not on the phone or in person. My father who is the only family member I have left I haven’t said a word to him since my brothers death in 2011. Before that I talked to him twice in 30 years. Hi, Kim. So sorry about the loss of family, but you’re right. Sometimes we are better off without them if they are toxic. Facebook can be a nice way to stay connected. Blood doesn’t always make family. I enjoy books that allow me walk alongside a person as they evolve in their character. I especially like ones that have someone else in the picture (generally a love interest) that assists them in that growth. Hi Jolene! Wow! What a great family and tribute to your grandmother. Interesting comments, my husband’s aging widowed mother cut ties with her only son when he asked how he could help her maintain her home and property. A toxic relationship. So very sad to read the remarks of toxic family members. As an immigrant, I was separated from my extended family by an ocean and for decades by the Berlin Wall. I missed seeing my two grandmothers, aunts, uncles, and cousins. My grandfathers were deceased before I was born. My dad’s father died in 1918 of WW1 injuries 6 weeks before my dad was born. My mother left her mother when I was five – next time I saw my grandmother I was 26 and married. I enjoy reading about second chances and mending broken relationships. Enjoy your weekend. Sun is shining in Michigan, but still cold – in the 30s. Hope Spring arrives this week! Best wishes. Family history is not always a smooth path. My husband’s parents are from Mexico so some of the family histories are lost. My grandmother is the 5th generation in Texas (I’m 7th) so it’s easier to keep track of everyone. lol. Congrats to grandma. What a wonderful time for family. We celebrated my grandmothers 100 birthday a few years ago. She left us 3 months later. But what a wonderful time we all had with her. These family memories are precious. And the wonderful stories we can pass down through the generations. 100 wow. That’s awesome. Yes the story telling is the best. I love to see redemption. That makes for a compelling storyline. Beautiful! I love family themes, Especially redemption. Every family has its skeletons hiding in the closet so it’s fun to see a happy ending. I love exploring family themes. Putting people together with different family experiences. What a blessing to have a close family. My parents and grandparents are all gone as are my husband’s. Looking forward to the new stories. Hi Pam. I have lost both of my parents, so having my grandmother is a true blessing. My grandfather and my husband’s grandmother are turning 90 this year and it has not been an easy journey lately. They’ve both faced major life diseases, lost their spouses, but have been strong in facing every new day of life. I love to read about stories that show real life mistakes we make then show the hope, forgiveness and redemption when a life is changed. God can heal hearts that let Him in and forgiveness is accepted and given and lives are restored. 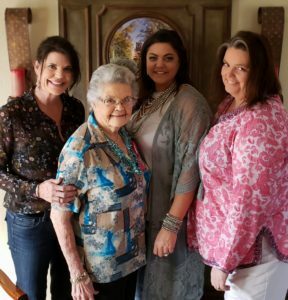 It is wonderful to see your beautiful family celebrating your grandmother’s 90ith birthday together. What a blessing you have to have her and have learned from her wisdom. When my mother died 25 years ago, my half-sister and half-brother, who is now deceased I found out cut me out of their lives. They had a different father and were adults when I was born so we were never close. I have been grateful for the love and acceptance that my husbands family has given me all theses years. My mother-in-law was amazing and everyone loved her. My children were blessed my having her in their lives. I just hope I can be a fraction of the same to my grandkids. Lorel, thank you for sharing. Your grandkids will be blessed by your love. Your grandmother looks great! What a blessing!!! I enjoy reading about characters who really trust in God and have high integrity. Thank you Ellie. She is a blessing. What a wonderful celebration! My grandma is 92, but loves on opposite coasts from me, so I’m not able to celebrate her birthday with her each year. I enjoy many different themes in books. I don’t think I can choose a favorite. The only thing I really dislike is when a story feels forced or pushed along too quickly. Meylanda, thanks so much. I love a good variety too. Congrats to your grandma! Thank you for your wonderful books! Congratulations! Family celebrations are a blessing! My mom will be 89 on Thursday and my parents will be married 72 years on the 31st. What a wonderful looking family! And what a joy to have such a loving family. Not everyone has that and, it can be very lonely. Thankfully, we have a God that’s always there when no one else is. I love cowboy stories. My grandma is 93 and it is a blessing to still have her in my life. What a Beautiful Family their is nothing like family that is for sure Thank you for sharing this post with us! 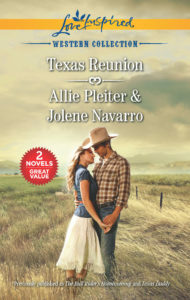 Love your books and love reading about cowboys! Thank you so much Sarah. Cowboys are fun. What a wonderful memory! My grandmother is 89 and she’s still going strong. She loves to read Christian fiction! Hi Dianna. Strong is good and I think reading is great for the mind. My grandmother loves reading. What a celebration, and great memories! Cut ties can be hard, because we hope for something good. But you’re smart to make that tough choice. Bless you.